IE browser imposes higher security settings for the local content and intranet files. When testing the HTML5 videos on IE 9 browser from the web page saved on your local computer, you might get this warning: "Internet Explorer restricted this webpage from running scripts for ActiveX controls." Many html5 video users may have already noticed that there is a Allow Blocked Content button right beside the above IE warning message. It is frustrating though as if you click on this button to allow the html5 video, your IE9 browser will load the web page again but not the HTML5 video. Please note that this HTML5 video load fail issue happens to IE 9 browser and when you are playing a local HTML5 video gallery only. See also:Why IE blocks HTML5 Video Loading. It does not happen to any other browsers or earlier IE versions, it does not bother your HTML5 video on websites. IE 8 and earlier IE versions do not support HTML5 video, so they will not load HTML5 video at all. The display of live HTML5 video on websites will not trigger this IE 9 warning. You can disable this message and let the HTML5 video play on your IE browser by changing your IE options. 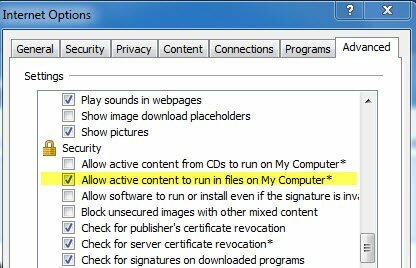 Go to Internet Options >>Advanced tab, scroll down to the security section there should be an option “Allow active content to run in files on My Computer”. Please enable this option and make sure to restart your browser. This should allow your HTML5 videos to run on your IE browser. Based on our test, we found that HTML5 video works better on a web server other than your local computer, not only due to the local browser security restrictions but also other aspects such as MIME types, etc. The generated HTML5 video & player works better with absolute URLs. If you load the HTML5 videos with relative path to your hard disk, the HTML5 video can’t load in IE9. Other than uploading them to remote server and testing from your website. Alternatively you can setup IIS on your local machine.